Caffeine in hojicha roasted green tea – Hojicha Co.
Hojicha is a roasted green tea, originating in Kyoto, Japan. The loose leaf tea consists of a blend of leaves or stems gathered from harvest of Sencha, Bancha, or Kukicha. While traditional Japanese green teas are only steamed, hojicha is also roasted in high temperatures. Along with removing most of the bitterness, the roasting process also removes nearly all of the caffeine. 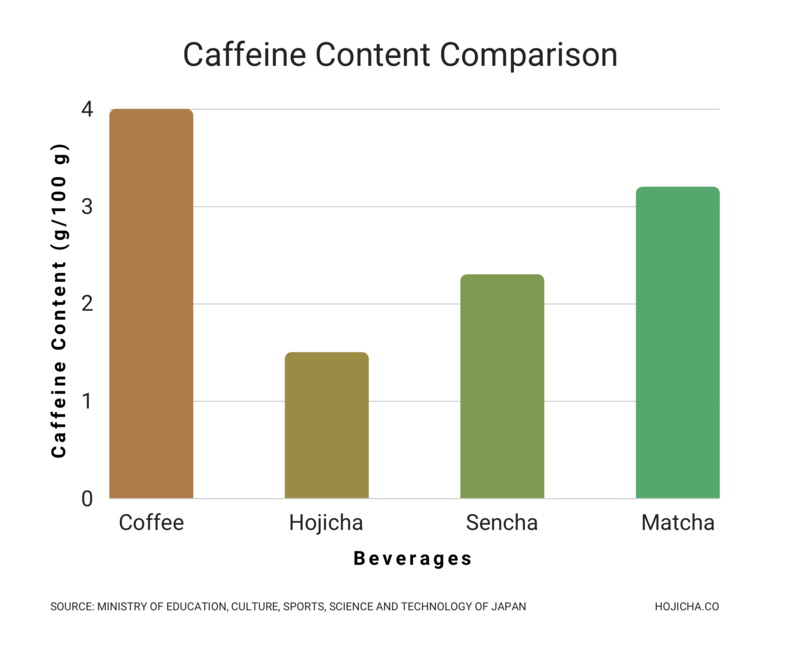 A standard serving size of one cup of hojicha (250 ml) contains about 7.7 mg of caffeine. As hojicha has virtually no caffeine, it doesn’t cause the anxiety and jitteriness that coffee drinkers experience. Furthermore, hojicha calms the body with help from its L-Theanine and pyrazines. More alarming is that drinks containing high caffeine are also associated with increased blood pressure and risk of heart disease. Those seeking to protect their heart and improve their health can benefit from drinking hojicha. Since hojicha is low in caffeine, it can be sipped anytime. This makes hojicha the perfect alternative to coffee for those seeking a warm and toasty drink in the afternoon and evening. Hojicha is prepared by steeping the leaves in 90°C water for as little as 15-30 seconds. The rich and naturally sweet flavor of hojicha is deepest when infused in hot water and slightly cooled before drinking. As hojicha’s signature earthy aroma fills your room, you’ll be tempted to steep it again for another hot tea, latte, or even to be enjoyed cold later on.